When it’s hot in the day but slightly cooler in the evenings, sometimes a salad doesn’t quite cut it; I’m after something with a little warmth and zing for those colder evenings. 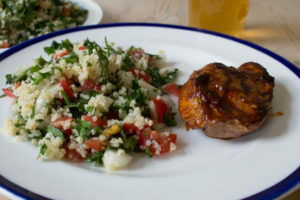 This Harissa Lamb with Tabbouleh came about for two reasons: firstly I had some harissa paste leftover from a previous chicken version and secondly I had two lamb steaks which were crying out for some Middle Eastern flavours. Also, this recipe is part of an upcoming post where I look at eating organic on a budget so it worked out really well to use up some lovely veg and herbs I had in the kitchen. Also, if you make double the amount of tabbouleh it’s great for lunch the next day, particularly with some toasted pitta bread and hummus. Start by cooking the bulgur wheat according to packet instructions. If you don’t have bulgur wheat you can use cous cous or quinoa. I have made tabbouleh with all three and they’re all equally as good. While the bulgur is cooking prepare all the vegetables and herbs and put into a bowl. Once the bulgur is cooked, add this to the veg in the bowl then add the lemon juice, olive oil and a sprinkling of salt and pepper. Mix well and put to one side. Heat a frying pan to a medium heat and add a little oil. Season the lamb steaks on both sides then put into the pan. Cook the lamb, turning over to make sure both sides are lovely and brown until cooked through (or cooked to your liking). Just before they are cooked brush each side with the harissa paste while still in the pan so the paste catches the heat slightly and caramelises. Serve the lamb with the tabbouleh. Similar to lots of my posts recently, this meal is ready in around 30 minutes, is full of flavour and makes the most of what I have in the fridge and cupboards at the time. I think this would be fantastic with some lamb koftas or butterflied chicken cooked on the barbecue then brushed with the harissa for the last few minutes of cooking. The more parsley and mint you add, the more intense the flavour (and colour!) is. I prefer to keep the herbs roughly chopped as I like the texture with the crunchy onions and soft tomatoes. This is my kind of summer cooking. What a delicious and healthy meal! I don’t eat lamb, but that tabbouleh is definitely a must have ! 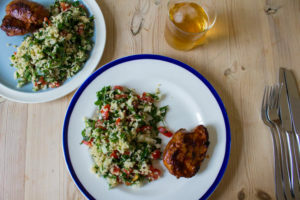 We love tabbouleh and this looks utterly delicious!!! Love all the fresh herbs you used in this dish Caroline, take care! This totally reminds me that I want to play around with harissa. I enjoy it, but I’ve never tried making anything with it at home. Sounds like a delicious recipe! Tabbouleh is one of my all time favourites. Great summer recipe! Looking forward to read your blog entry on how to eat organic on a budget! Great balance of a grain salad with some warm meat. That’s how I like to eat, too. : ) I keep saying I want to grill some lamb and now you’ve inspired me to get shopping and cooking. Simply delicious, it doesn’t get much better than Lamb & Tabbouleh Caroline! Lamb and harissa is a wonderful combo, isn’t it? This looks terrific — great dish. Thanks. This recipe sounds amazingly delicious. Lovely share! tabbouleh is the perfect side dish for these hot, humid days–it’s so refreshingly light and bright! i STILL have not tried harissa, though i know i need to because i’m positive i’d love it. this meal looks awesome! I have to play around with HARISSA! This is my kind of recipe! Love all these flavors: love lamb, love harissa, and absolutely LOVE tabbouleh! I could eat tabbouleh every day of my entire life. Such a wonderful summer recipe, pinning, and thanks for sharing!